This is the edition I read. 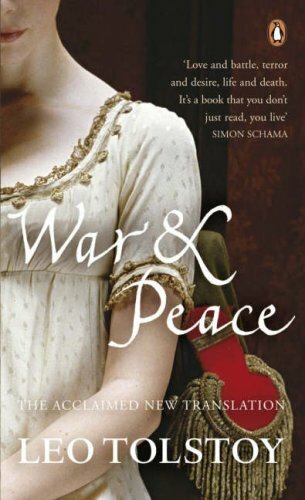 I bought War and Peace at a fabulous English bookstore in Zurich in the summer of 2007. I started reading it with a moderate level of consistency on July 31st, 2008. I to Epilogue, Pat II in May or June of 2009, and then stalled because it was so dense. I finally finished it in September of 2009. To begin a review of the book I will spend ten minutes or so free writing whatever struck me. Andre was my favorite main character. He is arrogant, self-centered and uncaring at times, but he is also an acting intellectual. In that he is the type of person who thinks deeply about things and does things, as opposed to many [e.g. Pierre for most of the book] who merely think and talk. It does require a bit of a suspension of disbelief to get over his muliple near-deaths and miraculous recoveries, but those all pay off with his spectacular death. The dream sequence Tolstoy relates as Andre hangs in limbo is absolutely beautiful. Something that struck me time and again as I was reading was how precise Tolstoy was in his description of the subtleties of human life. He was able to micro-analyze the captivating eyes of Princess Marya who cannot recognize their own beauty because when she looks into the mirror she sees nothing. Because, as he says, when we look for these traits in ourselves we cannot see them, it is only others who can. He does that, then is able to go macro and discuss the movements and strategies of multiple armies encompassing thousands of men with a proportionately engaging level of detail. I do not really know how he is able to achieve such extremes and hold them within the same novel. I would also really like to commend Anthony Briggs for his excellent translation. I guess I do not really know if it was good or not, but most of the time I felt like I was reading English, not Russian translated, speaks to the excellence of Briggs’s work. One of the recurring ideas of the book is how characters inevitably fall into what was expected of them. Andre becoming the war hero after resisting for so long. Pierre marrying Natasha and becoming an importat good man in the morally bankrupt aristocracy. Nikolay Rostov saving his family’s good name by marring Marya, going back on his childhood promises to Sonya. They all resisted and wandered in their youth, thinking of doing other things and chasing what they then believed to be ideals, but with time, they filled the roles placed out for them by their parents and society, and this was not a failure or a hypocrisy to their youthful selves and ideas.